Natsu Dragneel is the main male character of the series. Natsu has a carefree and reckless nature and constantly bickers with other members of the guild. Sometimes comes off as an idiot. He has a competitive relationship with frequent teammates Gray Fullbuster and Erza Scarlet; Gray tends to insult Natsu, prompting frequent skirmishes, while Erza, an S-class wizard, represents a way for Natsu to prove how strong he is. Despite his reckless and headstrong nature, Natsu is a skilled tactician and can pick up on an opponent's abilities and weaknesses very quickly. He is also vehemently loyal to Fairy Tail, and does not allow anyone to sully its name. Natsu suffers from motion sickness from all modes of transportation, including trains, carriages, and people carrying him on their back; the only exception is being carried by Happy. He is voiced by Tetsuya Kakihara in Japanese and Todd Haberkorn in English. 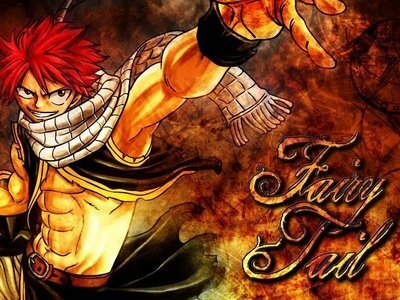 Natsu's nickname is "Salamander", and he is often recognized by his pink hair, scale-skin scarf, and fire magic. He was raised by the dragon, Igneel, who taught him how to talk, write, and use an ancient style of magic known as "Dragon Slayer". Because of his magic, Natsu can eat any flame other than his own for nourishment. He can also emit fire from any part of his body. The size and power of the flame is a direct result of Natsu's mood, so when properly motivated in a battle he is recognized as one of the strongest wizards in Fairy Tail. During the series, Natsu consumes some Lacrima containing Etherion, the magic beam that was fired by the Magic Council and captured in solid form in the crystal, which greatly improves his abilities; his skin becomes scaly, and his speed and the strength of his fire are also greatly increased. This is known as the Dragon Force, the highest level of Dragon Slayer magic, allowing one to gain the power of a dragon. In Mashima's one-shot short story that served as the basis for the manga, Natsu was originally a spirit, and had horns on his head.